With Spring and Surtex around the corner, fresh new ideas keep coming to mind. Healthy Food choices are so visual and fun to illustrate.
" Be in the moment". An affirmation that I have been work on for a while. As easy as it sounds not so easy to practice. Once you get the hang of it, a brilliant state of being. I am currently working on a series of art to go with a variety of affirmations as part of my collection of new work for Surtex. Perfect for calendars, cards, notebooks even wall hangings. 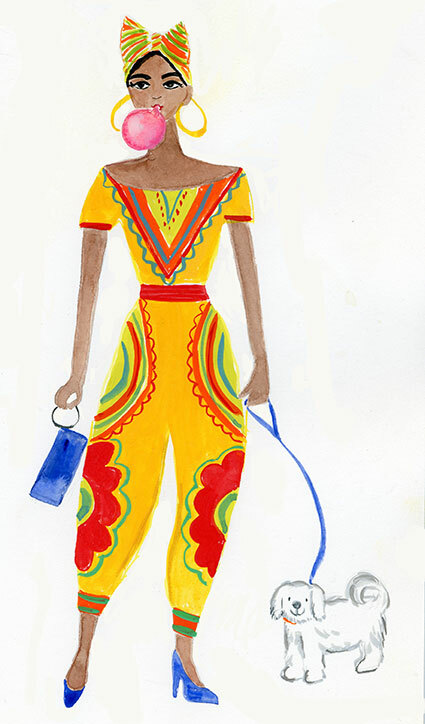 I am working in my classic water color style, in bright hues. The peppermint green background contrasts with the foreground. Enjoy! Hoping to see this on Licensing products soon! Here's To spring! Where is it?? Meanwhile I had fun doing this Children's illustration piece. The bold lines and splashes of color adds to the messiness of the activity -Water color and collage.